It all sounds like a premise for an alternative history novel or docudrama. “Traitor” Joyce is, after all, one of the most vilified figures of his era. But the facts in the foregoing are not only a matter of record, they’ve been extensively written about for the past fifteen years, in a never-ending stream of books and articles. The revelations are all part of a vastly bigger story about wartime intelligence that’s been unravelling for decades, particularly since declassification of MI5 files began in 1999. The story as it stands now shows that Joyce was a longtime personal and professional friend of Maxwell Knight, the spymaster known as “M” of MI5. In the 1920s, Knight was Director of Intelligence for the British Fascists (not to be confused with Mosley’s British Union of Fascists, which came later). From the BF, Knight was recruited to government intelligence, first MI6 and then MI5, where he headed up his own section targeting Communist subversion in politics and trade unions. 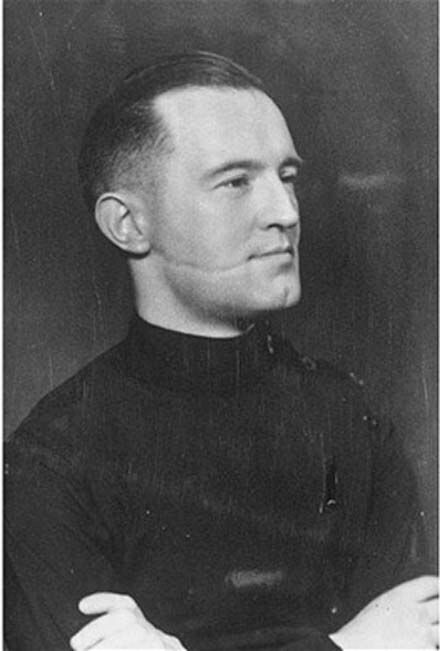 In the early 1930s, Knight attempted to recruit William Joyce, too, whom he’d known through the BF since 1924. Joyce was by now busy pursuing a Ph.D. in psychology, and declined. Nevertheless, by 1937 Joyce was on the MI5 books, not merely as expert on Communist groups, but on the internal politics of Mosley’s BUF, which he had just quit. Knight came up with the idea that Joyce should move to Berlin, become naturalized as a German citizen, and a full-fledged Nazi—Our Man in Berlin. A double-agent of sorts, except his target wouldn’t be German intelligence itself, but the Soviets. The story of Joyce and MI5 intersects other famed spy and diplomatic crises of the era, notably the case of Tyler Kent, the American Embassy cipher clerk who copied illicit communications between President Roosevelt and Admiralty’s Churchill, and was imprisoned. The Kent case was a Maxwell Knight operation, in which suspected Nazi/Soviet assets were caught in a “sting” when they posted a coded message to William Joyce in Berlin. While it mainly concerns British intelligence services, it’s ultimately an American story, too; the American services at the time were little more than a junior adjunct of the British. And by birth, William Joyce was American. Joyce’s persecution and posthumous defamation has always seemed most peculiar. When he was brought back to England as a prisoner in June 1945, Parliament rushed through a special new Treason Act, for the specific purpose of convicting and hanging him. This was still Churchill’s wartime coalition government, a very Soviet-friendly stew of Labourites and Tories, some of them actual Communists. Joyce’s conviction and execution as a British “traitor,” when it was clearly shown that he was American by birth and German by naturalization, was bizarre in the extreme. As is the unique venom showered upon him by journalists and history-scribblers over the past seventy-three years. West goes on about her “small, nippy” monster for two or three hundred words, then proceeds to lay into the Joyce supporters who showed up at the trial. There’s an old blond floozy, there’s a tiny hunchback, there are people who look like gypsies or madmen. Elsewhere she tells a fabulous, unsourced story about an old toff who observes Joyce’s excellent horsemanship at a 1930s weekend party, and agrees that Mr. Joyce rides well, “but not like a gentleman.”  Like Joyce, Rebecca West was of Anglo-Irish background; she clearly had issues. Like West, Holmes concocts fake news in his “fully sourced” biography. He advances a fanciful and quite undocumented story of how Lord Haw-Haw got his famous facial scar. When he was 18 years old and guarding a Conservative parliamentary candidate speaking in South London in 1924—a Jewish candidate, by the way, named Jack Lazarus—Joyce was jumped and razored by what he and his nearby friend Maxwell Knight called a gang of Communist thugs. That is the story that Joyce and Knight told, and the one reported the next day in the press. But in the Holmes version, the culprit was actually an “Irishwoman” who supposedly had followed Joyce all the way from Galway, where the adolescent Joyce had done courier duty for the Black and Tans in 1921. The purpose of Holmes’ tale is to paint Joyce as a liar and a coward. But the evidence is not there. Like West, Holmes likes to tell an anecdote and then claim it as fact. The popular press has had a hard time framing the Joyce-MI5 story. It’s too complex, there’s too much cognitive dissonance. If you say Lord Haw-Haw was an intelligence agent on a mission in Berlin, it must mean he was secretly an anti-Nazi all those years; and a quite brilliant one at that—but if he was, then why did he get a noose instead of a knighthood, or a medal at least? Why didn’t he tell somebody about the MI5 connection at his trials? The evidence is that he did not do so either out of loyalty to Knight or in acknowledgment of the brute fact that such a revelation wouldn’t matter. MI5 already knew his story, and the prosecution had already stitched him up on a fake charge—that as holder of a British passport till 1940 he was liable as a traitor. The fix was in. Aged just 17 at his death, [Heather] has just put her name to an application to the Criminal Cases Review Commission (CCRC) which asserts that not only was her father not technically British, and therefore unable to be a traitor, but he was also a double agent for MI5 throughout the war, a protégé of the spy master who inspired Ian Fleming to create the Bond character M.
Duped Goebbels and Hitler! What a movie this would make! But Joyce didn’t dupe anyone. When he went to Germany, he seemed to be sincere in his support for National Socialism. That was his selling point as a spy. If you wanted to send someone who would completely pass vetting by Dr. Goebbels—who better than William Joyce? Knight was aware, or suspected, that the Service had been well and thoroughly infiltrated, much as British Rightist groups had been (e.g., both Guy Burgess and Kim Philby had joined the Anglo-German Fellowship in the mid-’30s, on instructions from Moscow, for intelligence as well as to sanitize their own Communist histories since their days at Cambridge). The one clear instance where we have direct evidence of communication between Maxwell Knight’s end and Joyce’s is the Tyler Kent/Anna Wolkoff affair. Kent, an American Embassy code clerk, was a suspected Soviet and/or German asset; in 1939 he was transferred from Moscow to London. Wolkoff was a Russian dress designer who moved in far-Right London circles and met Kent in early 1940. Maxwell Knight put together a sting operation in which Wolkoff was asked to send a coded letter to Joyce at Berlin Radio, via neutral diplomatic delegations. This letter was then intercepted by MI5/Knight and used to arrest Wolkoff. In the course of this ruse, Wolkoff’s connection to Kent was uncovered; then his accommodation was raided, where MI5 found hundreds of secret Embassy communiqués, some between Roosevelt and Churchill, as well as the membership roster of The Right Club (an organization headed by Captain Archibald Maule Ramsay, a Right-wing MP). American Ambassador Joseph P. Kennedy waived Tyler Kent’s diplomatic immunity, and Kent was subsequently convicted and imprisoned for some years, as was Anna Wolkoff. The new Churchill coalition government then used these discoveries as a pretext to round up a thousand nationalists, fascists, and peace activists, from May 1940 onwards, and imprison them without trial or habeas corpus. Some writers have speculated that the Tyler Kent arrest was actually part of a conspiracy to bring down Ambassador Kennedy. No doubt there were some who welcomed the embarrassment to JPK and his Embassy, but this outcome could hardly have been foreseen at the start. MI5’s target was not Tyler Kent but Anna Wolkoff and her circle of presumed “pro-Nazi” conspirators, who might be passing information not only to Berlin but to Moscow. Tyler Kent’s packet of papers were just a windfall that fell into their lap. If there was any such anti-Kennedy initiative by MI5, it was poorly thought out, as it could well have blown up in their faces. Kennedy could have decided to protect Kent, or might even have chosen to publicize the secret FDR-Churchill communiqués, which were illicit to begin with. This is really what brought Tyler Kent down, not some sting operation against Ambassador Kennedy. And whatever the Soviets really had on William Joyce, there can be little doubt that they knew his MI5 background, and that they believed he was a spy sent to Berlin to trace Soviet moles. At war’s end he was a Person of Interest, and he had to be got out the way. Joyce would no doubt have been honoured to know that he had been the subject of a Cabinet meeting. He would have been pleased, too, to learn that in Moscow the Kremlin was busy bringing pressure to bear on the British Ambassador regarding his case. The Soviets had been critical of the way the Anglo-Americans had conducted themselves at the Nuremberg Trial [i.e., the International Military Tribunal, which had begun a few weeks earlier] and had been monitoring the progress of the British treason trials for any signs of liberal weakness. As an MI5 memo phrased it that week: “We are worried about what the Russian reaction might be if the Lords quash his conviction. The Soviets had recently brought similar pressure upon the French, forcing them to condemn to death not only Pierre Laval and the ancient Philippe Pétain, but such minor figures as the writers Robert Brasillach and Pierre Drieu de Rochelle. The 89-year-old Pétain’s sentence was commuted to life imprisonment by his onetime protégé Charles de Gaulle, but even de Gaulle dared spare no one else. “Lord Haw-Haw” was a nickname that a London tabloid columnist invented for another British broadcaster, who sounded like a comic P. G. Wodehouse figure; but it stuck primarily to William Joyce. The most recent mainstream book dealing with the general subject of Joyce, Maxwell Knight, and MI5 is Henry Hemming’s biography of Knight, Agent M: The Lives and Spies of MI5’s Maxwell Knight (Ashland: PublicAffairs/Perseus, 2017), which has been tremendously popular and well-received in England; it was recently Waterstone’s Book of the Month. The Knight/MI5 connection to Joyce has also been touched upon recently in Francis Beckett’s A Fascist in the Family, reviewed here  last year, and Colin Holmes’s Searching for Lord Haw-Haw (both from Routledge, 2016). Haw-Haw: the Tragedy of William and Margaret Joyce was probably the first in-depth treatment of MI5’s use of Joyce, particularly in regard to the 1940 Tyler Kent/Anna Wolkoff case. Stephen Dorril’s Blackshirt (originally published by Viking in 2006, new imprint by Thistle Publishing in 2017) discusses the early connections between the British Fascist movement and MI5’s anti-subversion unit, and uses MI5/Joyce information on the internal politics of Mosley’s British Union. State Secrets by Bryan Clough (Hove: Hideaway, 2005), an early distillation of the MI5 files, suffers from an overload of conspiracy hypothesis but makes insightful criticisms of other literature. The Defence of the Realm (London: Allen Lane, 2009), Christopher Andrew’s “official” history of MI5, is very “sanitised,” as The Guardian wrote, but is still useful for what it shows and doesn’t. “Technically, Joyce was hanged for making a false statement when applying for a passport, the usual penalty for which is a small fine.” A. J. P. Taylor, English History 1914-1945 (Oxford: Clarendon Press, 1964). Pro-Soviets in the Churchill coalition included Stafford Cripps, a House Leader, aircraft minister, and Ambassador to the Soviet Union; and Ellen Wilkinson, a Minister of Education who was a onetime Communist Party member. The Foreign Office and SIS (MI6) meantime was famously shot through with spies, beginning with Burgess, Philby, and Maclean. Regarding the Treason Act of 1945, targeting Joyce, Americans will readily notice that it was both an ex post facto law and a “bill of attainder.” The bill’s sponsors and Learned Judges justified it with the laughable excuse that it was merely a modification to the Treason Acts of 1351, 1695, etc., etc.! Rebecca West, The Meaning of Treason (New York: Viking, 1947). Rebecca West, “The Crown vs. William Joyce,” The New Yorker , September 29, 1945. Colin Holmes, Searching for Lord Haw-Haw: The Political Lives of William Joyce (London: Routledge, 2016). Holmes’ story about the scar has nevertheless been picked up, uncritically, by Francis Beckett in his biography of his father, Fascist in the Family (2016), and by Henry Hemming in Agent M (2017), about Joyce’s friend Maxwell Knight. While his version might be plausible by itself, he leaves too many evidentiary holes, such as failing to provide any corroboration or transcript. Furthermore, the tale is opposed by every other account of the event, and dubiously claims a dubious source: the 86-year-old ex-wife of Joyce, now dead, who was not an eyewitness, did not then know Joyce, and supposedly waited nearly seventy years before vouchsafing this nugget to an unfriendly biographer. Joyce did in fact play with the idea of declaring his MI5 ties, as he wrote his wife. Farndale, p. 315. Daily Express, May 22, 2011. See J. A. Cole, Lord Haw-Haw and William Joyce: The Full Story (London: Faber & Faber, 1964 & New York: Farrar Straus & Giroux, 1965). Joyce’s diaries, documents, and the Skardon debriefing are photographed and transcribed. Antony Percy, Misdefending the Realm (Buckingham: The University of Buckingham Press, 2017). E.g., Bryan Clough, State Secrets. Guy Liddell, 1940 Diaries .